It was with some excitement and trepidation that I started recording the so-called ‘1916 Corridor’ in Kilmainham a couple of weeks ago. Now, this corridor is a focal point of the tours and the only location that all the tour guides ensure is visited. It is easy to understand why this physically inauspicious corridor is considered so important – at least 6 of the executed leaders of the 1916 Rebellion (which is considered by many as the first symbolic act towards eventual Irish independence) were held on this corridor prior to their executions in the stonebreakers’ yard below. This corridor potentially held some very important and interesting graffiti, but also I was aware that it would contain huge amounts of later graffiti due to the associations with the men who died in the rebellion’s aftermath and the ongoing interest in them. All but two cells in the corridor of 14 were accessible – the only two that were not were Willie Pearse’s cell (which was located next door to his more famous brother, the rebellion leader Patrick [or Padraig] Pearse) and on the opposite side of the corridor an ablutions cell. As both these cells had older padlocks on their doors I could not gain easy access despite the cell of Willie Pearse being of great interest to me. The story of the execution of the two brothers is told by all the guides as it is a sad tale – the younger brother, Willie, was not considered a leader and not expected to be executed, but due to his familial connections he was shot the day after his brother after being placed in the adjacent cell just after Patrick had been executed. Therefore, although the cells sit poignantly side-by-side the two brothers were never simultaneously held within them. To date, the ablution cells tend not to be so interesting and – in contrast to the assertion by Abel & Buckley in the American context that the most secret graffiti is associated with toilets (1977: 16) – there is very little graffiti at all located in this context. Even less of the graffiti found is contemporary with the site’s continued functioning as a prison. There were also a number of portraits in the cell – none of which appear to be of Pearse (although the male portraits all follow Pearse’s convention of the side profile, I suspect this is a coincidence as they occur in similar form elsewhere). The male portraits are unusually all named and there is a partial portrait of a female who is portrayed face on. The most unexpected find, and perhaps most interesting – was a small laminated photograph with a type caption on the reverse referencing memories of the three ladies depicted during happier times. This photograph is a relatively recent addition and had evidently been carefully prepared, laminated to ensure its ongoing existence and placed under the heating pipe at the opposite end of the room from the holes in the door and wall. How it arrived in its current position I am unsure as the doors have been locked on these cells for some time and its placement does not seem accidental?! A most interesting, if non-graffiti-related find! Another cell that interested me greatly due to its lack rather then oversupply of graffiti was the cell of Countess Markievizc. As her cell is mentioned by almost all the guides and she is a figure of some interest and veneration amongst nationalists (it is claimed that at least 250,000 people flocked to the route of her funeral cortege in 1927) I was startled by the lack of graffiti of any form in her dark and pokey corner cell. 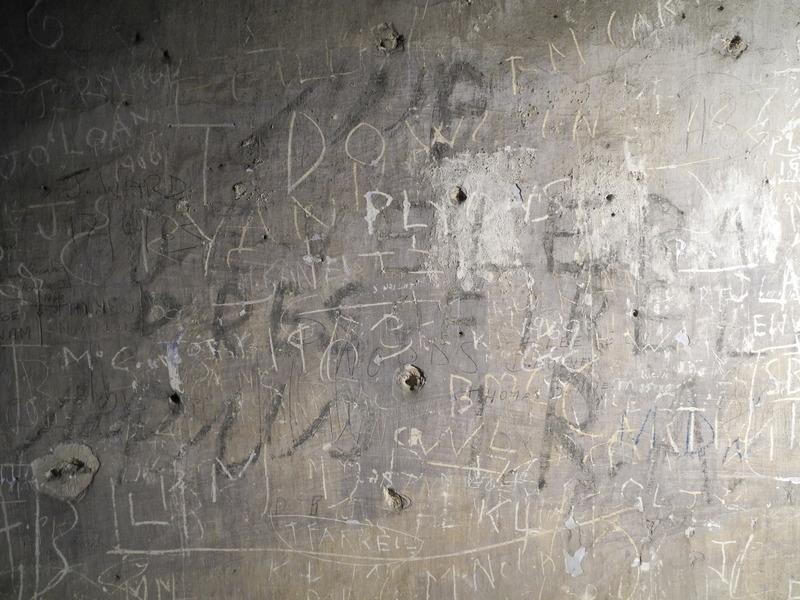 There had been some much later additions but very few of the scribblings from the civil war period onwards that were evident in many of the other 1916 cells. 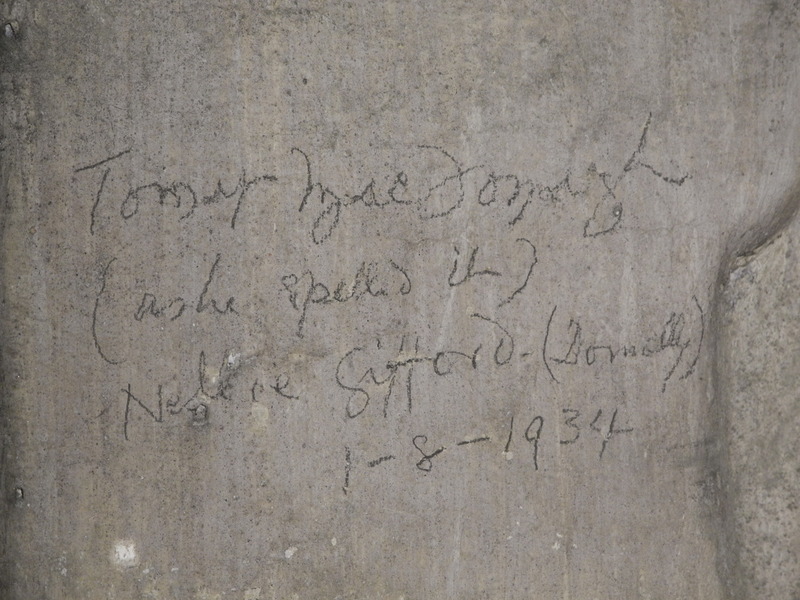 The only piece of graffiti that showed any real individuality was a pencil note from Nellie Gifford (to accompany those in Thomas MacDonagh’s and her own cell) to state that this was the cell of the Countess. Otherwise her cell is bereft of any graffiti images or direct references to this seminal character. There are a number of possible explanations for the disparities between such important figures from the 1916 Rising. Perhaps the interest in adding to the cells from this floor relates primarily to those who were executed at the time rather than those who were able to continue their fight for Irish independence afterwards? Perhaps the Countess is a relatively recent figure of interest, answering a more modern need for female figureheads in the stories of the Rising (although there are many biographies relating to the Countess in recent years, they also date back from the 1920s and 1930s so there appears to be have been a long-term and abiding interest in her)? Perhaps the sometimes unflattering references to the Countess, including the biography of Sean O’Faolin in 1934, dampened enthusiasm for this rather amazing person? The possibility that her cell was the victim of sporadic whitewashing in the aftermath of the civil war (which appears to have happened in other cells) is also a possiblity – although this does not explain why there is so little graffiti from the post-closure periods? It is difficult to understand the spread of graffiti on this corridor – there is definitely a difference in variety and quantity between the two sides of the corridor that is most noticeably apparent in a comparison of Pearse and Markievicz. Another possibility I have considered links into differences that i have found whilst recording in the impact of levels of light and warmth resulting from the positioning of the corridors in relation to the sun and their impact of their different periods of design (with small cells and windows dating back to the original corridor in 1796). The cells on the side that MacDonagh, the Pearses and Plunkett had resided have infinitely more light, were warmer due to this light (and the porous limestone that the prison was built of) and the cells are slightly larger in size than their neighbouring cells across the corridor. Indeed, it has been notable throughout the prison that graffiti predominantly appears in greatest quantities where the light hits the walls (although there are some notable exceptions, which includes graffiti, particularly on the ground floor, that appears to be of a more secretive nature and is placed in areas that are not easily viewed or accessed). Having just finished recording this cell and moving to a new corridor (a ‘1921 corridor’, if one believes the plaques!) I am spending some time trying to understand the differences between the graffiti spreads and forms between some of the more ‘cult’ cells. There are probably a number of explanations for Patrick Pearse’s cell to be overflowing whereas Countess Markievicz’s is relatively undisturbed but clearly the graffiti of the cells is revealing differences in the interactions with the various cells that may be telling of relationships with the 1916 leaders in the past, the impact of environmental conditions on drawing visitors to particular sections in the jail and the interventions of the whitewash pot of the authorities. In time, comparing the spread of graffiti across the various floors may provide some insights into whether the graffiti interactions are guided by famous past-inhabitant or a mixture of other factors. This entry was tagged #Kilmainham #KilmainhamGaol #PadraigPearse #PatrickPearse #CountessMarkievicz #ThomasMacDonagh #ThomasClarke #JosephMaryPlunkett #graffiti #EasterRising #Easter1916. Bookmark the permalink. 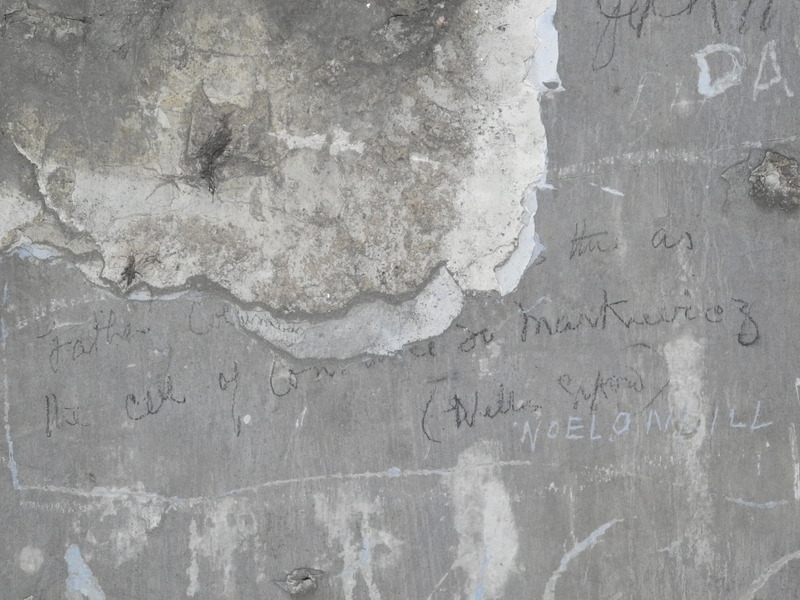 ← Narratives of previously derelict buildings or should we record animal ‘graffiti’? ?